The Birmingham Jefferson Convention Complex (BJCC, formerly the Birmingham-Jefferson Civic Center) is a sports, convention and entertainment complex located just north of I-20/59 downtown. It consists of a 17,000 seat arena, a 3,000 seat concert hall, a 220,000 square foot exhibition hall, a 1,000 seat theater and various banquet and meeting rooms and other facilities. The executive director is Tad Snider, who was appointed as interim director after Jack Fields' contract was terminated in December 2010 and was subsequently tapped for the permanent position. In 1962 a group of architects met with area business leaders and volunteered to put together a master plan for Birmingham's central business district. A major element of that plan was a new "civic activities center" to include sports and performing arts venues and exhibition space. Leading the charge were Vincent Townsend of Operation New Birmingham and Birmingham Symphony Association president Alexander Lacy, who worked closely with the Jefferson County Legislative Delegation during a special session to establish the Civic Center Authority of the Cities and County of Jefferson County (now called the Birmingham-Jefferson Civic Center Authority). The authority would construct and manage the proposed facility. With momentum growing behind the idea of constructing such a facility, architect William A. Briggs of Richmond, Virginia was hired to research the needs of probable users and to generate a detailed program report. A $2.35 million federal "Urban Renewal" grant, awarded in December 1965, provided funds to undertake those studies and to begin acquiring land and paying designers and engineers. Though the actual civic center was presumed to need a four-block area, nine blocks, between 19th and 21st Street and between 8th and 13th Avenue North were included in the study area. When the federal funding was announced, Townsend said that, "another link has been forged in the chain of reality toward that accomplishment of the finest cultural and convention complex in the entire country." It was hoped that the project could be completed in time for the city's centennial in 1971. Three special county-wide taxes totaling a projected $2.4 million per year were levied for the project. $250,000 per year was reserved to fund operating expenses while the rest could be used to finance a bond issue for capital investments. The enabling legislation required that the design of the center be generated through an open architectural competition conducted according to American Institute of Architects guidelines. On June 22, 1966 Lacy led a group of 50 officials from Birmingham and Jefferson County who hosted a press luncheon at the Plaza Hotel in New York City to announce the competition. Any architect with a minimum of four years' registration in any state would be eligible to submit a design in the first phase, for which three months was allotted. Nearly 900 firms requested the project specifications and 277 submissions were received for first-round judging. Each firm submitted two panels measuring 30" x 40". All of the entries were displayed in Municipal Auditorium the week of November 11, 1966 while the 5-person jury examined them. Finalists were given six months to produce additional drawings and a model of the project, extending south to include Woodrow Wilson Park (now Linn Park) in order to show the design's connection to the existing municipal institutions on the south side of I-20/59. Judging of the final entries was begun on May 29, 1967, with the winner announced the next morning at a breakfast hosted by Mayor Albert Boutwell. With Obata's strong recommendation to the committee, Qualls was selected as the winner with Rapson as first runner-up and Fitch as 2nd runner-up.1. In reviewing the architectural design of the new facility for Birmingham magazine, Philip Morris said "The Birmingham-Jefferson Civic Center is a superb piece of architecture [...] Buildings are sculptural and powerful and the greatest bargain Birmingham ever got. The plaza between will be one of the notable plazas in the country." Quall's firm, Geddes Brecher Qualls Cunningham, received the commission and produced the final construction documents. Construction of the Exhibition Hall began with a groundbreaking ceremony in July 1969 with dynamite marking the "explosion of creativity, energy, imagination and cooperation" responsible for making the project possible. 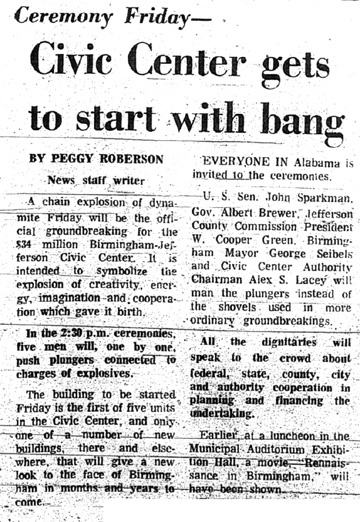 The detonations were ceremonially set off by Senator John Sparkman, Governor Albert Brewer, Commission President Cooper Green, Mayor George Seibels and Civic Center Authority chairman Alex Lacey. A prior luncheon featured a screening of the film "Renaissance in Birmingham" at the Municipal Auditorium exhibit hall. The first section to be completed was the North Exhibition Hall, which opened in January 1972 for the first Birmingham Boat Show. At the time construction began the total cost was estimated at $34 million. By the time it was completed in 1976 the total had grown to $104 million. The electronic sign visible to I-20/59 was the subject of some controversy. A local sign company negotiated to place advertisements on it in exchange for providing signage within the center at no cost. Members of AIA Birmingham lobbied the authority to remove the ads from the sign in order to preserve the architectural integrity of the complex. The sign was replaced with more sophisticated electronic marquees in 1997 and 2010. The Legacy Arena at the BJCC, formerly called the BJCC Coliseum seats about 17,000 for sporting events and up to 19,000 for concerts, with several luxury suites and a press box. The 22,400 square-foot oval-shaped arena floor measures 110' x 220' and is 75' feet from floor to ceiling. Backstage areas include locker rooms, dressing rooms, a press room and a VIP Reception area. The 2,700-seat Concert Hall hosts concerts and Broadway-style productions and is the home of the Alabama Symphony Orchestra pops series. Built in 1973 with 3,000 seats, an $11-million renovation was completed in 2008 to update seating areas, circulation spaces and backstage equipment. The 220,000-square-foot Exhibition Hall is used for Birmingham's largest trade shows and conventions. It is divisible into three smaller halls and can accommodate 1100 exhibit booths. The North Hall was the first to open in 1972. The East Exhibit Hall opened in 1992. The BJCC's theater opened in 1974. It contains 1,000 total seats, but normally utilizes 800. When arranged for a proscenium stage 100 seats on either side are removed, and for a thrust stage, those are opened, but the first rows are covered with additional stage platforms. The theater is used for operas, ballets, and smaller concerts and stage shows. The theater stage is 132 feet wide and 48 feet deep with a grid height of 58 feet. The proscenium is 28 feet tall by 70 feet wide. There are 2 rehearsal areas, 2 chorus dressing rooms and 6 dressing rooms, including a star's dressing room. The original construction included lighting capable of switching between 10 pre-programmed scenes. A Birmingham News columnist enthused that the new stage would provide top-of-the-line facilities for the city's numerous amateur and academic theater groups. In practice, the requirement of paying union scale to cast and crews made the BJCC theater inaccessible to most local groups. The Birmingham Children's Theatre was contracted early on as a house company for the new facility, which it has primarily shared with touring shows. The complex contains 64 meeting rooms totaling 100,000 square feet of meeting space, including a 16,000-square-foot ballroom that can seat up to 1,200 for banquets. A full-service restaurant is located in a glassed-in atrium in the BJCC's interior courtyard. It operated in the 1980s as "The Restaurant at the Civic Center". The ten-story Medical Forum, with meeting space, a 275-seat auditorium, classrooms, conference space, and offices, is also located here. The adjacent 838-room Sheraton Civic Center Hotel provides a large ballroom and other convention and meeting facilities nearby. The Uptown entertainment district, financed with $57 in public bond money backed by the city's lodging tax, opened in 2013-2014, providing an open air "plaza" area along with an array of new restaurants to augment the Convention Center. The district is anchored by the 303-room Westin Birmingham hotel. A TopGolf location opened near Uptown in 2017. The BJCC has several parking lots and decks in the vicinity, most of which are operated by the BJCC. From the early 1970s to 2014, there were also 750 free public parking spaces under the I-59/20 downtown viaduct across the street from the BJCC. In the early 2000s, the BJCC made plans for a major expansion of the facility to increase and upgrade the exhibition facilities and construct a new covered multi-use stadium. Commitments to fund these plans were curtailed by political backlash against using public funds to construct a "domed stadium". The 2006 election installed a Jefferson County Commission that promised not to support the full expansion plan. Accordingly the BJCC authority began shifting its priorities toward expanding convention space and developing an entertainment district without the multi-use stadium. After support for a smaller arena emerged, the board asked its consultants to project the costs and benefits of a 40,000 seat covered multi-use facility that could be configured for football. Meeting in Salt Lake City in February 2007 the Civic Center board, including Birmingham mayor Bernard Kincaid and Jefferson County Commission president Bettye Fine Collins, voted unanimously to pursue a $505.5 million expansion which would include $380 million for a 40,000 seat arena which could be used to provide 175,000 square feet of exhibition space. Other projects included in the package of plans included $17 million for land purchases, $10.5 million for additional parking facilities, $10 for improvements to infrastructure, $6 million for upgrades to existing facades, $5 million for a new skywalk to the existing arena, $2 million for refurbishing of the existing arena, and $75 million to pay off current debts. The Commission was unsuccessful in lobbying the Alabama legislature to affirm and extend the Jefferson County occupational tax which had been challenged in court. Without being able to rely on that source of funds, the county could not pledge its support. Part of Birmingham's 2003 "City Center Master Plan" envisioned replacing the existing elevated highway with a below-grade corridor which would simplify interstate access to the downtown area, mitigate the noise and visual effects of highway traffic, and allow for a landscaped plaza to bridge over the highway. If it had been carried out, this plan would have created the connection between the BJCC and Linn Park which was envisioned as critical during the original design competition. Ultimately the Alabama Department of Transportation went forward with replacing the interstate bridge with a taller structure with fewer access ramps. A private developer, Performa Entertainment Real Estate of Memphis, Tennessee, was contracted to develop land djacent to the BJCC as an entertainment district, tentatively called The District, a $50 million development which would begin construction as early as Fall 2007. Another private developer had once announced plans to build a major new luxury hotel adjacent to the BJCC regardless of the outcome of the expansion plans for the public facility. After taking office in November 2007 Birmingham mayor Larry Langford won support from the City Council for his Birmingham Economic and Community Revitalization Ordinance which included doubling business license fees in the city to fund a $500 million bond issue for construction of a domed stadium. Although he had campaigned on the possibility of building a dome in the western part of the city, he told the BJCC authority and the Birmingham Regional Chamber of Commerce that the downtown site was best. After the measure passed, he announced that the downtown site was unsuitable for a large-scale development and that land owned by Milton McGregor near the Birmingham Race Course on John Rogers Drive would be better. At the same time he indicated that the city's annual $3 million payment to the BJCC, used to finance existing bond debts, would be redirected to a new authority which would operate his proposed dome. Langford's efforts failed to come to fruition. In August 2016 the BJCC Authority unveiled a new master plan from Populous which included a 45,000 seat open-air stadium adjoining the complex north of the Uptown district. The design allowed for expansion to 55,000 seats and would serve the UAB Blazers and the Birmingham Bowl. The projected cost for the entire renovation project was nearly $300 million, of which $174 million was projected for construction of the stadium. In his 2017 State of the City address, Birmingham mayor William Bell alluded to a $200-225 projected cost for an open air stadium and a $450 million-plus cost for an enclosed stadium, which he would prefer. He hoped to secure a public-private partnership to finance the project and said that an announcement could be expected "fairly soon." The BJCC Authority projects being able to cover an additional $10.7 million per year for debt service for improvements. The Jefferson County Commission voted in January 2018 to commit to $1 million a year for 30 years as its contribution to debt service on the proposed new facility. New Birmingham mayor Randall Woodfin requested that the City Council commit $3 million a year for 30 years as an investment in revenue-generating infrastructure. The Birmingham City Council approved that proposal in March. UAB and corporate partners have also committed $4 million a year, part of which includes leasing the stadium, along with sponsorship deals and naming rights. On July 2018 a $300 million bond package was issued to fund construction of the new stadium, expected to open in 2021, and arena upgrades, expected to be completed in 2022. This page was last modified on 25 January 2019, at 06:44.